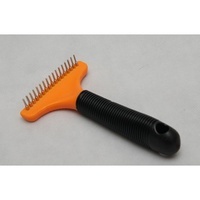 Ideal for brushing long haired pets or dog's with double coats. Helps remove dead hair when shedding or dematting your pet's fur. You are looking at a PetsNPals rake brush for dogs.